125 guest rooms and suites which all have balconies over looking the bay. Hotel Cala di Volpe is located in Sardinia on the Costa Smeralda. There are three airports in Sardinia - Cagliari (south coast), Olbia(northeast coast) and Alghero (northwest coast). Olbia is the closest airport to the luxury resort Hotel Cala di Volpe. 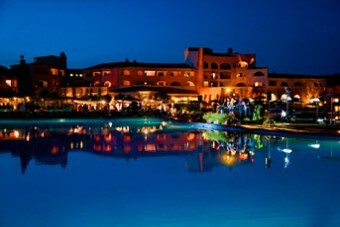 Hotel Cala di Volpe is a luxury hotel on the Sardinian Coast over-looking the Cala di Volpe Bay. The hotel offers a mix of elegance and glamour with spectacular views of the coastline, crystal blue ocean and the mountains and has been voted one of the bests luxury resorts in the world. Hotel Cala di Volpe is overlooking a charming local fishing village however also offers world class cuisine and plenty of water activities to keep you entertained. There are 125 guest rooms and suits which are all decorated with traditional furnishings and offer personalized yet discrete service to all of the guests who choose to stay at this luxury resort. For more details on the room facilities please refer to the side menu. With the “Dinearound” program, when you stay at Hotel Cala di Volpe, Cervo Hotel, Costa Smeralda Resort, Hotel Pitrizza, or Hotel Romazzino on a full board basis, you can dine at any of the resort’s restaurants or at local restaurants: Il Pomodoro (year-round), Il Pescatore, the Grill and the Pevero Golf Club (seasonal). You will enjoy breakfast at your own resort, and then either lunch or dinner at any resort or local area restaurant. This flexible meal plan may be reserved as part of your room rate, or may be added as a supplement. Reservations should be made with the concierge of your hotel at least 24 hours in advance. 24-Hour Front Desk, fitness facility, Concierge Service, Tennis Courts, Water Sports, Laundry/Valet Service, 24-Hour Room Service, Hairdresser, Boat Rentals, Car Rental Service, Live Entertainment, Massage Treatments, Babysitting Service, Golf Course Nearby, Wake-up Service Available, Airport Pick-Up and Drop-Off (Limited), Multilingual Staff, Safe Deposit Boxes, Business Center/Services, Air-Conditioned Facilities, Outdoor Pool (Seasonal), Outdoor Children's Pool (Seasonal), Private Beach, Barber/Beauty Salon, Jewelry Shop, Concierge Desk, Sauna, Boutiques, Gift/Sundry Shop, Putting Green.